Zamp Portable Solar kits set up in less than 5 minutes and out of all solar set ups have the ability to take the most advantage of precious sunlight. Portables can be positioned directly at the sun throughout the day. By keeping the Portable solar kit facing the sun at the most direct angle the solar panels receive more direct and powerful sunlight that can be converted to electrical energy. This is called optimal sunlight. We’ve done away with the Anderson style power connectors. Their longevity and versatility were not enough. We’ve developed our own solar plug system with pre-molded UV rated wires and a mountable solar port that can be installed permanently to the battery and accessed from outside quickly and easily. 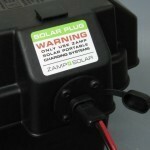 This makes it easy to plug in a Zamp Solar Portable as easy as plugging into a wall outlet at home. This also reduces the need to fumble around with tight battery box spaces and battery compartment doors eliminating the risk of connecting the battery clamps to the wrong battery terminals or poor connections. We like to know what’s going on with our equipment and we know you do too. Our new Digital Deluxe Solar Charge Controllers are all built with large LCD readout screens and multiple LED indicator lights to monitor the system. The LCD screen displays the battery voltage, amp-hour from the panels and amp-hour over a period of times that were delivered to the battery. Indicator lights indicate if the system has solar power and is charging or in float mode. The other set of indicator lights indicate at what charge level the battery is at. In addition to the above we have also integrated 5 stages of charging in our charge controllers for optimal battery health and longevity. All of our solar charge controllers on our Portable Solar Charging Systems have PWM technology and are water resistant and weatherproof. 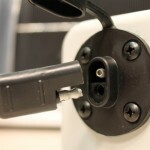 The EZ-View Bracket holds the solar charge controller on a swinging arm that will allow the user to pull the controller up and lay flat for viewing. 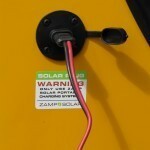 No bending camper or crouching RVer to view the solar charge controller. Easily view the controller from a standing position and monitor charging activity. While it’s easy to pull the controller to a easy viewing position the spring loaded bracket will also keep the wires tucked while disconnecting the unit for storage. UV wires are UV resistant. It only makes sense to have wires that are going to be in the sun constantly to have the ability to resist the suns damage. Our wires are from a U.S. manufacture and come with a 15 year estimated lifespan. Smooth sliding legs without any screw to tighten. They fold out and stay out, fold in and stay in. Setting up a portable is quicker with quick sliding legs.